The "Design Center"� at Ryland was an exceptional time for our family. 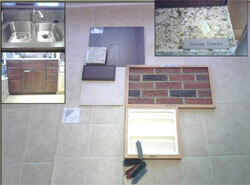 At the Design Center, we had the opportunity to pick and choose all of the options that will make our home our own. Ryland's Design Center was very professionally laid out and we were given an appointment with a professional designer, as well a complete privacy for the entire process. The Design Center is reminiscent of a top notch home center, without all of the hardware or lumber. Displays for everything from flooring to cabinets, siding, fixtures and even electronics are on display as options for your new home. My family was well prepared for our Design Center visit, as we had spend several weeks at local home centers getting our thoughts and ideas together for the session. We brought along paint samples, granite samples and hardwood samples to show the designer what we had in mind for our home. Over the next five hours we went from area to area picking out the carpets, trim, kitchen, bathrooms and all other aspects of interior design and decor that make a house a home. Construction materials are the most important consideration when building your dream house. If the materials that you picked are shabby and weak, it could mean thousands of dollars on recovery costs alone, not yet considering the repair costs. It could make every day a risk for living on your supposed-to-be haven for your family. Strong and high standard materials should be the only materials that your construction team knows. Picking them out does not always mean that you have to spend big bucks. There are still some ways that you can spend less while still getting the utmost quality and strength from your materials to make every part of your house durable and safe. Before buying any materials, always ask for quotes from your contractors about what materials are needed. You can also ask your architects and engineers on what brand of material you should look out for and what brands are best. They are the ones who work with these materials and thus know the strength and weaknesses of which is most suitable for you according to your house plan and budget. If you want to save on materials (other than cement and framing supplies as these need to have exceptional quality because they are needed for the foundation of your house), like tiles, doorknobs, and others, you can use some of these tips. The building plan for the house should be complete, exact and followed until the end. Numerous changes and unexpected modifications in the plans could lead to a blown budget. Thus, make sure that you have a clear and exact plan from the construction to the labor to get the job done. If your construction plan is big enough, you can get estimates from three different contractors and get the median. This will show how much you will more or less spend on your Home Construction. Make sure to have an extra budget for unexpected but needed changes. Either you can employ a construction company to take care of the project from buying materials to construction, or you can buy the materials from the quotes provided and look for cheaper options while the construction company takes care of building the house. There are seasons when materials for a certain project are cheaper. Take for example the building of decks. Decks are better built and used when there is a nice weather and thus suppliers and contractors increase the costs when summer comes around and decreases them after it, dragging along the prices of textured wood, patio furniture, gardening supplies, and other materials that you can use to beautify a supposed deck. Look out for these seasonal sales to save more from your budget and wisely pick your products. Always buy the materials that have high quality but give you a better chance to save more from your budget. You can buy if you want to save from other sources. The first of these is Discount Stores. Discount stores are shops that also buy construction materials from left over construction sites, fire sales, and manufacturer's discounts and sell to consumers at a higher price but less than the actual retail price. Some also buy factory seconds, materials that have slight to medium damage, but can still be used. You can also check the Want Ads. You can use the newspaper or even online advertisements to find cheaper deals. Some people are posting advertisement sales for construction materials that are left in their basement and want to free up storage space by selling them at a much cheaper price. Construction materials can be bought at local hardware stores as well. It is important to check on the quality of supplies available at these stores. If you are not sure about materials, you should check with a contractor to help you determine if the supplies are right for your home.